What George Fujii, a former member of Ernie Reyes, Sr.’s West Coast Demo Team, built in the rural town of Gardnerville, NV, is pretty amazing. His modern 5,500-square-foot facility, which he owns outright, offers many family-oriented programs and boasts everything from trampolines to a complete nutrition store. Sound business practices, combined with the good karma from his very extensive community-charity work, has rewarded Fujii’s school with some 275 active students. George Fujii’s grandfather immigrated from Japan to America in 1912, and went to work on the railroad. He served as a cook and gardener and, in the style of a real-life Mr. Miyagi, would go on to open the first commercial nursery in Reno, NV. His four children and many grandchildren would learn the Asian cultural values consisting of personal discipline and hard work. The renowned, hard-core work ethic, however, certainly got passed on, and it served Fujii well the rest of his life. Even though he didn’t learn karate or judo from his grandfather, Fujii got into wrestling when he was in middle school and it soon became apparent he had a natural gift for the sport. He wrestled all through high school and won several zone and state championships. When he traveled to a seminar in Reno, given by wing chun kung fu master William Cheung, Fujii discovered a new passion for the Asian martial arts. That led to his own stand-up ground-fighting methods he teaches in his school today. That eclectic approach was further refined when Fujii started training with the legendary showman, Ernie Reyes, Sr. of San Jose, CA, in 1980. Fujii became a senior member of Reyes’ famous West Coast Demo Team that gave performances all over the world. He also trained and traveled with Reyes black belt Tom Callos. They helped each other develop ideas and methods of both practice and teaching. He also earned a black belt in Brazilian jiu-jitsu from the Machado brothers. In addition, Fujii was an assistant high-school wrestling coach for 13 years. He has studied many Asian martial styles as well as boxing, firearms and survival training. $50,000 Deal on a handshake! In 1989, Fujii opened his first school in Nevada. The way they got there is a fascinating story of luck, perseverance and determination. So, Fujii had to start from the ground up and find a new location in the small town of Gardnerville, NV. He was having a difficult time finding a place with the right location, the right square footage, and at the right price. “A chain of events that I couldn’t have predicted led me to this place,” he says. “Some local businessmen with whom I had worked in the past came to me and told me how much they were grateful for what I had done for their families and children. At one point, it seemed like everything was lining up for Fujii. But then, he discovered that he would still need at least $50,000 to close the deal. The unusual story doesn’t stop there. The new building Fujii had found had the right location, the right square footage and the right price. But, it had previously been a sports bar and restaurant. The previous tenants had just gone belly up and walked out. They abandoned the place and left everything as it was. Fujii was looking at having to tear out the equipment, clean it up, and try to sell it himself one piece at a time. One of Fujii’s friends was restoring an old casino in town. He came over to say that maybe the whole kitchen set-up would be a good fit for his redo. “So, these same guys that had helped me buy the building asked, ‘What do you think this stuff is worth?’ “I gave them a figure and they wrote me a check for even more than that. “The day after we closed escrow,” he remembers, “there was a crew there to tear out everything and load it up into a bunch of big trucks. So, I went from being evicted from a facility that I had just put money into and still had a lease on, to having a great, state-of-the-art place that I own myself. Now, obviously, besides Fujii’s benefactors, he had a whole army of dedicated students who helped build the new facility. As it turned out, the neighboring space was occupied by a Thai restaurant, established before he bought the building. Fujii had them sign an extended lease. So now, he’s got a high-quality renter who’s paying a large chunk of the mortgage and they are locked in for many more years. Gardnerville, Nevada, is a rural community located 49 miles south of Reno and 20 minutes south of the state capital, Carson City. The population was 5,656 at the 2010 census. Estimated median household income in 2016 was $47,399. Median resident age is 48.8. 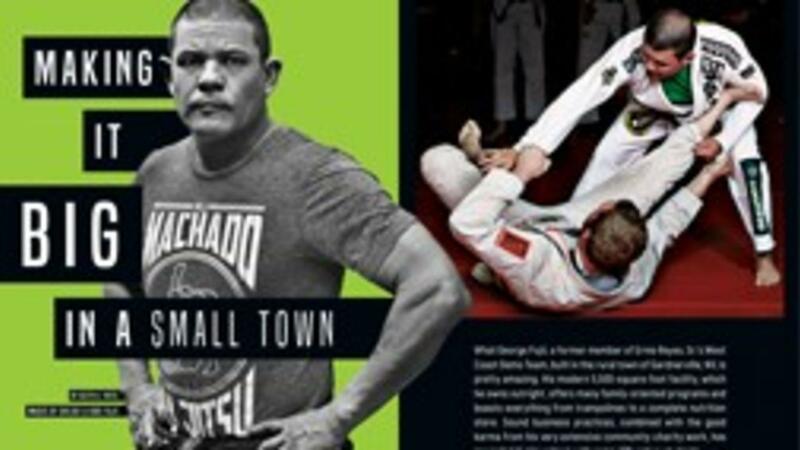 As many martial arts school owners are aware, building a bustling school business in a small town presents its own unique challenges. The very nature of a vast rural setting, as in Fujii’s case, comprises a different financial picture than running a school in a big city. Nevertheless, he says he wouldn’t have it any other way. Fujii’s school is amazing indeed. First of all, he currently has 275 active students. This number does not include his “cross-overs” — those clients in the traditional family programs that also participate in their MMA program. These clients, Fujii, explains, pay tuition for both programs. He’s able to handle that because of his multi-tiered approach and a great staff of instructors and also because everyone respects the other groups. There’s a 40-foot, tumble-track trampoline, plus, an in-floor trampoline, complete with a suspended bungee-backflip harness that allows students from five-years-old and up to practice their flips without fear of injury. In fact, Fujii conducts a special “Flipz-and-Kicks” program using the equipment.